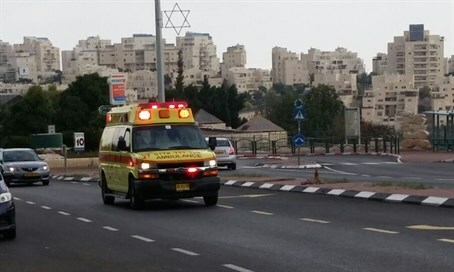 Arab terrorist stabs 65-year-old Jewish woman while she was shopping in Rahat and then fled. She is in moderate condition. A 65 year old Jewish woman was stabbed in the neck while she was shopping in the Bedouin town of Rahat on Saturday. Police have stated that the attack was nationalistically-motivated. The victim was taken by Magen David Adom paramedics who arrived on the scene to Soroka hospital in Be'er Sheva. She was in moderate condition. Following the original investigation, police have stated that the woman was stabbed by a 20-year-old Arab man who managed to flee the scene before being arrested. The woman was shopping with her daughter in the city's open market. "We saw a woman who was approximately 65-years-old who was walking and had received first aid treatment from her family members," said Gil Iskwoitz, one of the MDA paramedics who responded to the scene. "We put her into the ambulance and began treating her while we were taking her to the hospital. She was in stable but moderate condition. She told us that she had been shopping with her family in the open market in the city."